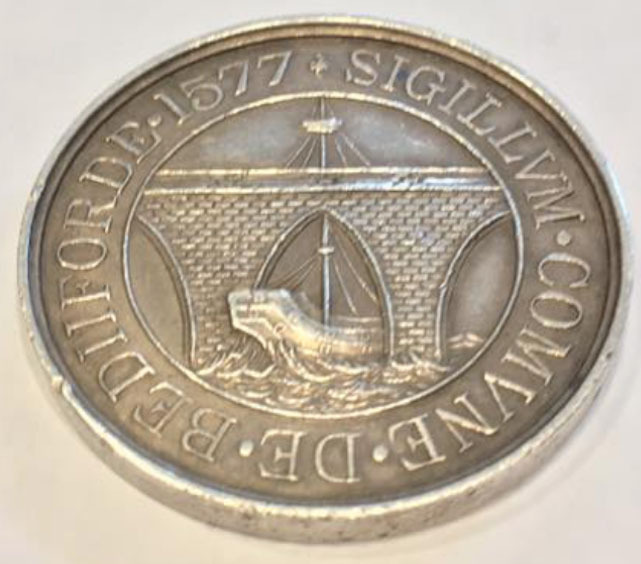 A hitherto unrecorded Bideford Tribute Medal. My thanks to Harry Staff for this information. This example awarded to 5624. Pte. W. H. Turner, Volunteer Co, Devon Regiment. In addition to the medals, there was also a parchment address, which was presented to the Volunteers as a group. 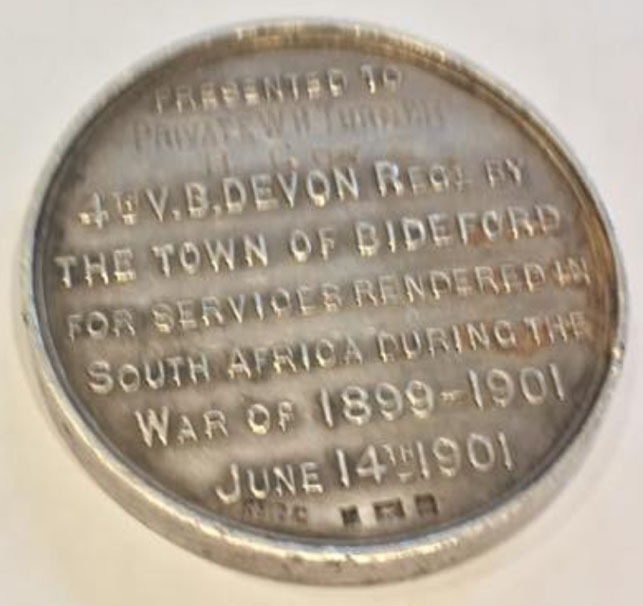 "The reception on Monday evening of the returning Bideford Volunteers who came forward so readily in January, 1901, to fight for their country was very enthusiastic. The men - Captain W. B. Dart, Bideford; Private J. Fulford, 21, Honestone-street, Bideford; Private J. Shaxon, Cross-street, Northam, Bideford; Private S. Braund, 3, Cross-street, Northam, Bideford; Private W. H. Turner, 3, Prospect-place, Instow, Bideford; the following had previously returned home on sick furlough, Private S. Shortridge, Barnstaple-road, Bideford; Private E. Lee, 60, Meddon-street, Bideford; and Private W. Tucker, East-the-Water, Bideford...…. "To Captain Dart, Privates Fulford, Braund, Lee, Shortridge, Shaxon, Turner, and Tucker, members of the Volunteer Active Service Company. On behalf of the ancient borough of Bideford it affords me great pleasure to welcome you on your return from active service in South Africa. It was with pardonable pride that, in common with others whom I have the honour to represent, I witnessed the outbursts of patriotism which led you to volunteer for the arduous and dangerous duties of the War in South Africa. We have from day to day followed the developments of the campaign in which you were engaged, and have rejoiced to know that you have maintained the best traditions of valour for which the men of Devon have ever justly been famed. We trust that on your return to civic life you will continue to be the subject of the same good fortune which hitherto has smiled upon you." ……….The active service contingent, with the two Yeomen who have been invalided home (Troopers King and Prouse), will be entertained to dinner by the Mayor at the Music Hall to-morrow evening, in fulfilment of his promise when the Volunteers left. A medal, with the borough coat of arms on one side and a suitable inscription on the other, will then, on behalf of the borough, be presented to the Volunteers who have taken part in the War."